Turkey on a yacht?! Break the tradition with Atlantic Yacht and Ship : Atlantic Yacht & Ship, Inc.
Turkey on a yacht?! Break the tradition with Atlantic Yacht and Ship! It’s the week before Thanksgiving, and it’s time to decide which family traditions to carry out this year. Traditions can include stuffing the turkey, cooking and baking all day, watching the holiday parade, football games, and Black Friday shopping. However, Atlantic Yacht and Ship encourages you to break the tradition and head for the water. Enjoy snorkeling, jet skiing and catching some rays on the bow with family. Even out at sea you can enjoy holiday festivities. Wait! Will turkey be on the menu? Are you wondering if it’s possible to cook a Thanksgiving meal in your galley? Cooking Thanksgiving dinner on your yacht can pose many challenges. First and foremost, is the limited space for prepping, cooking and cleaning. Second, the amount of utensils and kitchen appliances available for use. Don’t worry, we’re here to help with a few easy recipes that others have tried in their galley and succeeded. Many galleys are built with smaller ovens to save on space. An easy alternative to your sizing dilemma is to use a dutch oven on your stove top to cook the turkey. 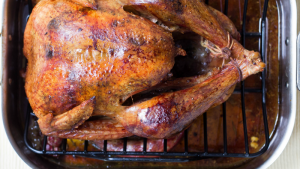 This recipe shows you how to cook the turkey in just a few hours and does not require babysitting. Pumpkin squares are a great alternative to baking a pumpkin pie. This recipe only takes five minutes to prep and thirty minutes to bake. Overall, Atlantic Yacht and Ship wishes everyone a Happy Thanksgiving and a blessed holiday wherever you celebrate.